Founded in l969, Seattle Counseling Service is the oldest LGBTQ mental health agency in the nation. 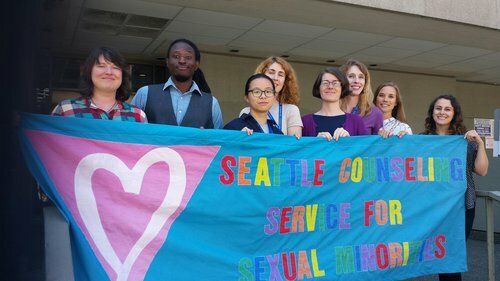 Seattle Counseling Service is a community resource that advocates, educates and serves to advance the social well being and mental health of the lesbian, gay, bisexual, transgender, and queer community. SCS provides individual, couples and group therapy, case management, crisis services. We have both a psychiatrist and a nurse practitioner that prescribe and monitor the medications of our clients. In addition, we have both abstinence based and harm reduction addiction services. Our internship program is designed for second year master level students in either counseling or social work. The internship provides the intern with a thorough knowledge of working in a community agency that focuses on serving the LGBTQ community. This experience includes direct client service hours, record keeping, using the DSM, clinical consultation, weekly individual and peer supervision. When I first moved to Seattle, I remember seeing the SCS sign and thinking to myself: “Sometime in the future, I hope I get to work there”. This past year, I had the opportunity to complete my internship at SCS and I can honestly report that the experience here was everything I hoped it would be. This year has been a period of intense growth, community building and connection for me. Every day I witness strength, wisdom and comradery in the people who work here and for me, those qualities define the energy of this agency. I have deep gratitude for my supervisors, fellow interns and the other wonderful staff here, who I could always count on for a hug, smile or word of encouragement when I needed it. I could not have imagine a more enriching program for internship, or a more talented team of people to support our community. Please note: Fulfilling multibody counseling hours can be challenging to complete within the one year Seattle Counseling Service program. Internships start in early September and ends the second week of the following August. If interested, please complete the Internship Application and email it, your cover letter, and resume to hiring@seattlecounseling.org by March 15th to be considered for fall placement. Working in my ideal agency was just wonderful. I had never dreamed that I could talk about queer stuff every day during work!! I love my co-workers. They are just so generous, supportive and warm. I had a fantastic supervisor – Gottesman — you’re so amazing and charming! Although I had a lot of doubts and struggles during my internship, the journey taught me way more than what I had learned from school.